Experience a powerful, one-hour dramatization, "The Way of the Cross"
Over the past 35 years, "The Way of the Cross," a one-hour dramatization of the Stations of the Cross by the 8th grade class of American Martyrs School has had a significant impact on those who have witnessed the power of its message. One of the purposes has been to help us all realize the incredible suffering Jesus undertook out of love for all of us. For the 8th grade students, it is an intense spiritual exercise over the six weeks leading up to Good Friday. During casting, they write essays about the characters they want to play. During the six week rehearsal period, they study the Biblical history and text, write about the characters they are playing, and after Easter, they discuss how the experience impacted them. 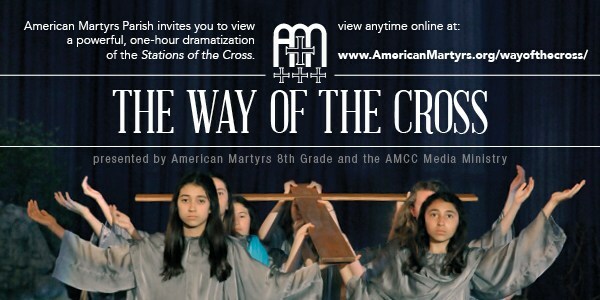 The American Martyrs School class of 2018 will dramatize a one-hour "Way of the Cross" on Good Friday, March 30 at 12:30pm at American Martyrs Church. Everyone is invited. The Good Friday service (Liturgy of the Word, Communion and Veneration of the Cross) will follow at 2:00pm. This online version was produced by our AMCC Media Ministry in 2016.